Even back in February, aerial firefighters were predicting a busy fire season in Western Canada. A relatively mild winter had given way to a dry spring with above seasonal temperatures, creating the perfect conditions for a wildfire. 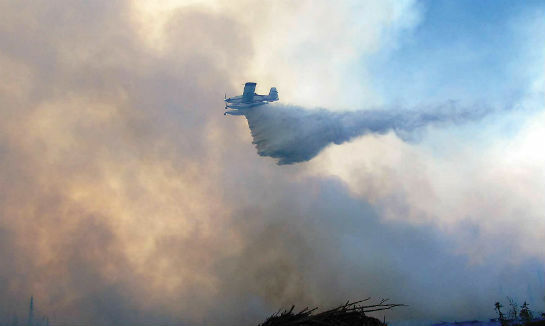 On April 19, Alberta Agriculture and Forestry put its contracted aerial firefighting crews on duty—a week earlier than usual—to open lookout towers and perform designated smoke patrols. Sunday, May 1, was a scorcher. 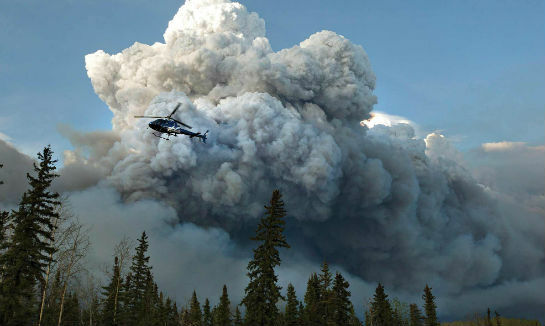 Heather Pelley—a Bell 407 pilot with Summit Helicopters whose machine is contracted full-time to Forestry—spent the day on standby at the Grayling Creek Fire Base, 45 kilometres south of Fort McMurray, Alta. Crews were on “man-up alert,” meaning they had to be in the air within 10 minutes of receiving a call. Around 4:30 p.m. that afternoon, the call came. Pelley and her four-person helitack (HAC) crew were airborne in minutes. “As I was lifting up from the fire base, the dispatch office started to relay the coordinates. But as I cleared the trees, it was very apparent that we didn’t need them,” she said. They—along with an Alpine Helicopters Bell 212 flown by Dave Mulock and carrying another HAC crew—were the first helicopters on scene. After dropping off her crew, Pelley began bucketing. But the fire, later dubbed “The Beast,” was a challenge right from the start. The head was already crowning; flames and black smoke made it impossible to attack it from that angle. The tail end of the fire was burning in grass under high voltage transmission lines. Pelley and Mulock were bucketing out of the nearby Horse Creek Canyon, dropping water on the grass fire to protect the HAC crews, while trying to avoid the power lines below. Air tankers and a bird dog aircraft were called in immediately. With tankers on the way, Pelley was assigned to fight a new fire that had sprung up in Fort McMurray’s TaigaNova industrial park. The flames were just 100 feet from a row of houses. “I started bucketing out of the Athabasca [River] on that. Dave [Mulock of Alpine Helicopters] was already working on it, along with Highland Helicopters; Canadian Helicopters came in and dropped a Forestry crew,” said Pelley. At the time of writing on June 10, the wildfires in and around Fort McMurray had waged an unrelenting attack for six weeks. They had consumed an estimated 581,586 hectares, forced the evacuation of more than 80,000 people, crossed into Saskatchewan, and had an estimated perimeter of 984 kilometres. A total of 2,794 firefighters and support staff, 147 helicopters, 233 pieces of heavy equipment and 16 air tankers were battling not just the Fort McMurray fire, but an additional 22 active Alberta wildfires. With all hands on deck, it’s not surprising that the helicopter community figures prominently in the epic battle. 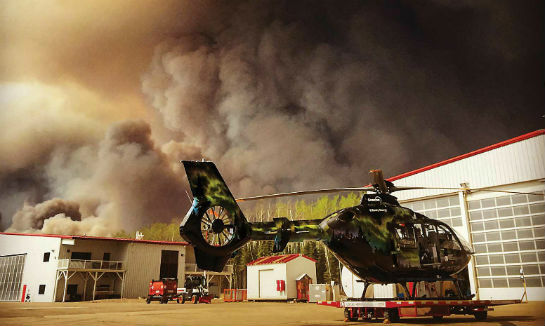 Since the fire began, most of the helicopter fleet at Fort McMurray-based Wood Buffalo Helicopters has been hired for local fire support, while other aircraft were assigned to initial attack duties on other wildfires. The company’s president and CEO, Michael Morin, told Skies that as of May 31, his fleet had flown a total of 1,400 firefighting hours. During busy periods, each machine averaged about six hours per day. Although an intense ground fire had swept through the woods just behind the hangar, Morin’s building was remarkably untouched. Pilots and maintenance crews opted to stick it out, remaining on site with the help of respiratory masks and temporary portable housing units brought in by Wood Buffalo Helicopters. The company’s hangar was scheduled for professional cleaning and restoration; meanwhile, it lost a 12-bedroom crew house to the fire, with other residences expected to be out of commission for months. The hangar is still standing over at family-owned Vortex Helicopters, too. Owners Ryan and Corie-Ann McAssey celebrated their 12th wedding anniversary on May 1 with the acquisition of a new Bell 212. Just a few hours later, all hell broke loose. Corie-Ann and their three children fled the city to family in Lac La Biche, 290 kilometres south of Fort McMurray, where they will remain until their home— which was saved, along with their hangar—can be assessed and cleaned. Meanwhile, Ryan remains in Fort McMurray, flying fire support and servicing regular contracts as needed. Since the 2016 fire season began with a bang on April 19 in Western Canada, aerial firefighting companies have been going full tilt. Although fire advanced to the edge of the airport, most of the buildings were spared. Ironically, the airport fire hall was consumed by the flames. Air Spray, founded in 1967 and headquartered in Edmonton, operates nine L-188 Electra heavy air tankers in Canada, plus 11 twin-engine Turbo Commander AC-690 bird dog aircraft. The bird dog—or lead aircraft—is flown by a specially trained pilot and also carries an air attack officer who directs the air tankers where and when to drop their 3,000-gallon retardant loads. Lane said that all early indications were pointing to a busy fire season this year, so Air Spray spent the winter getting ready. Demand was never higher than on Tuesday, May 3, as “The Beast” closed in on Fort McMurray. Tongues of flame licked at the city and smoke obscured the sky, prompting officials to issue a mandatory evacuation notice. People drove through walls of flame as they tried to make a southbound escape on Highway 63. At the airport, there was frenetic activity. When Air Spray was founded 49 years ago, the typical Canadian wildfire season lasted approximately 50 to 60 days, according to Lane. Today, that duration has almost tripled to 145 days, even stretching toward an incredible 220 days south of the border. There are a few reasons for the longer aerial firefighting seasons. While some of those may be related to climate change, another is that there are simply more assets to protect now than there were a half century ago. Not only are fire seasons getting longer, but they are also getting more intense. Jeff Berry is the director of business development at Conair and a 39-year wildfire industry veteran. Headquartered in Abbotsford, B.C., Conair’s roots go back to 1958. 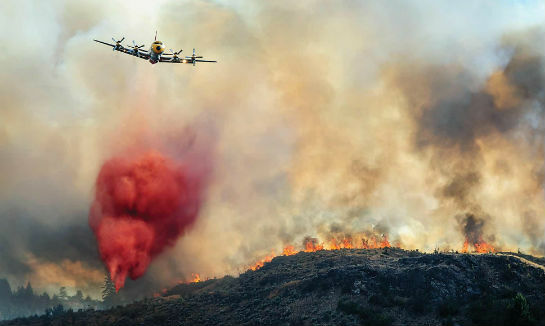 It now operates close to 70 aircraft that are contracted to fight fires in Alberta, British Columbia, the Yukon, Alaska, Australia and the U.S., including land-based and amphibious air tankers, as well as bird dog planes. 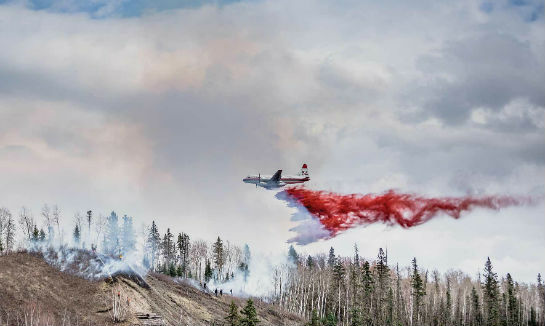 Now in its 47th fire season under the Conair brand, the company had 26 aircraft deployed in Alberta in early May when the fires consumed Fort McMurray. These included contracted Air Tractor AT 802 “Fire Boss” amphibious tankers, Convair 580s, and four Bombardier CL-215T waterbombers operated on behalf of the Alberta government. “We have flown far above normal hours for this time of year,” reported Berry. “On a large fire like Fort McMurray, our primary mission is to achieve attainable objectives. Working with the onsite command team, [Agriculture and Forestry] sets objectives and then dispatches air tankers, with an air attack officer and a bird dog plane, to get over the fire and work with the incident team on the ground. Their priority is always initial attack. Meanwhile, as fire seasons are growing longer and more extreme, governments are grappling with the growing cost of fighting wildfires. British Columbia budgeted $63 million to fight its fires this year, but by May 27 the province had already burned through $37.8 million—more than half—of those allocated funds. 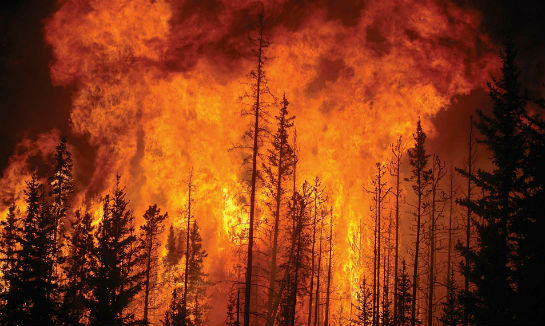 And, in an ironic coincidence, Alberta announced plans to cut close to $15 million from the provincial wildfire management budget on April 19, 2016—the very day that firefighting crews were called out for the opening day of an early fire season. 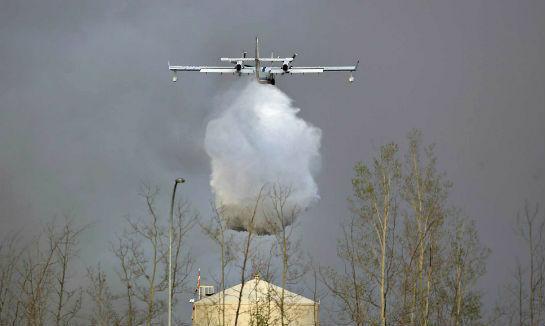 The previous contract covered a 123-day period, but Alberta now aims to cut 30 days of aerial firefighting coverage, guaranteeing crews from Air Spray and Conair a shortened 93-day term. The new 93-day contract period will expire on Aug. 16, meaning that Alberta will need to hire aerial firefighting assets on an as-needed basis after that date. Operators are most concerned about late summer, when wildfires could still happen after contracts have ended. With less revenue coming in, companies may have to consider contracting aircraft elsewhere, meaning they would not be available if the province did come calling. 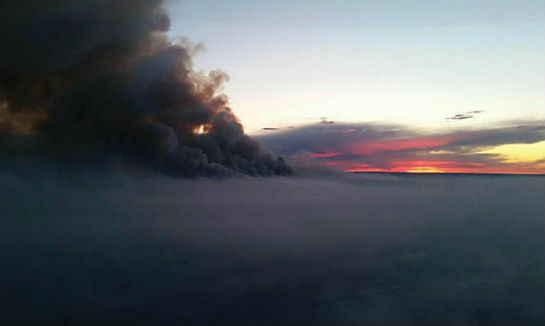 In the meantime, however, it’s business as usual in the skies over Alberta’s wildfires. In the meantime, he said, the company is focused on fighting wildfires alongside the government of Alberta, wherever its assets may be needed. Some aviation operations fared better than others in the wake of the Fort McMurray wildfires. While no helicopters or airplanes were lost to fire, businesses at the city’s airport suffered operational disruptions due to forced evacuation and facility damage. Paul Spring, president and operations manager at Phoenix Heli-Flight, a Fort McMurray-based helicopter operator, said the “new normal” keeps changing every day. When Skies spoke to him on June 10, Spring was just shutting down a temporary camp that had been established on the ramp outside his hangar. The facility—which housed upwards of 30 people, including staff who could not return to their own homes—was comprised of eight skid-mounted units, six of which were joined together into a full-service dormitory while two stand-alone sleeper units were placed in a quieter area for night shift workers. A camp cook and attendant kept everything running smoothly from the time the quarters were set up on May 6 to the time they were dismantled more than a month later. Spring said the temporary facility enabled Phoenix Heli-Flight to maintain operational functionality, so its crews could concentrate on fighting fires. 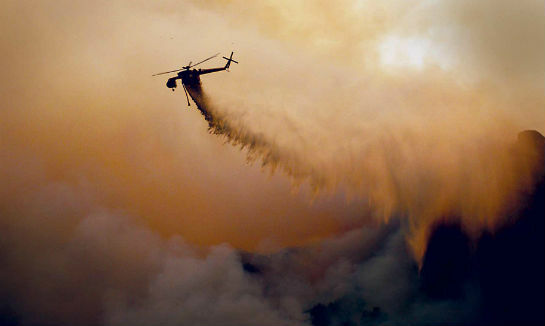 In a five-week period at the height of the fire, the company logged 1,200 flying hours with nine helicopters. But while the pace of business hasn’t slowed all that much, Spring said the biggest challenges in the aftermath of the fires have been financial. Phoenix Heli-Flight’s headquarters sits on a 36-acre parcel of land; more than 20 acres of woods surrounding the facility were lost. That, in addition to the flying, has kept everyone at Phoenix busy. But by June 10, said Spring, people had been able to slow down a bit and catch a breath. Now that the crisis point has passed, Paul Lane of Air Spray said there will be some lessons learned from the Fort McMurray fires. He said it’s common practice for mechanics, pilots, and managers to work with other aerial firefighters to establish best practices and share information. That spirit of cooperation extends to the helicopter industry as well. Morin of Wood Buffalo Helicopters said the industry pulled together, as it always does in a crisis. 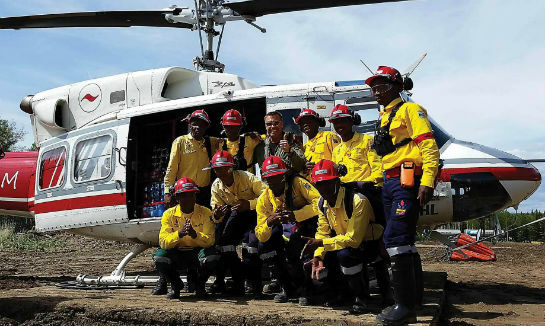 “On these large fires, there is always a huge amount of camaraderie between helicopter crews, regardless of the company name on the aircraft,” he said. Summit Helicopters’ Heather Pelley agreed. “Being on the front lines, I saw how we all came together 100 per cent, no one more than any other. Lisa Gordon is editor-in-chief of Skies magazine. Prior to joining MHM Publishing in 2011 to launch Skies, Lisa worked in association publishing for 10 years, where she was responsible for overseeing the production of custom-crafted trade magazines for a variety of industries. Lisa is a graduate of the Journalism program at Ryerson University.